While my Dad is Bishop he goes to Girl's Camp each year for Bishop's night and spends the evening with the girls in the ward. 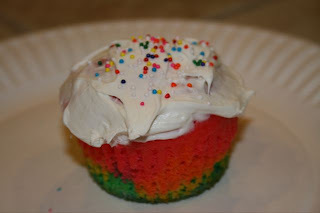 This year they all made tie-dye shirts at camp so I thought it would be fun for their treat to make tie-dye cupcakes. It is super easy, a little time consuming but fun at the same time. The recipe can be found here at my favorite recipe blog. 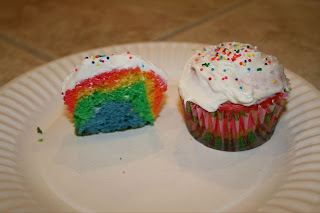 On their blog they did the frosting much more fancy then I did, but the inside it the best part anyway. Each one is different everytime.